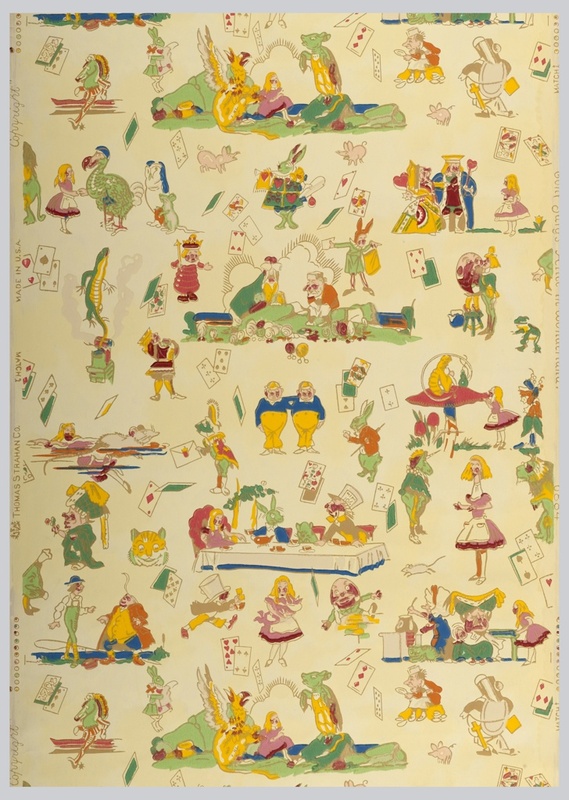 This charming children’s wallpaper illustrating the tale of Alice in Wonderland contains many of the delightful characters we remember from childhood: the Mad Hatter, Tweedle Dee and Tweedle Dum, Queen of Hearts, the caterpillar, and of course Alice, both big and small. This was designed by Tony Sarg, artist, illustrator, puppeteer, and balloon designer for the annual Macy’s Thanksgiving parade. His career took him from the German military, to an ad agency, then to illustrating magazines. He also designed barber shops for children and toy departments for stores, and his drawings became the delight of children. In the 1920s he started the Tony Sarg Company which produced marionette shows. In 1930 he started a production of Alice in Wonderland which became one of his most popular shows. The delightful and amusing characters on this paper must have been a joy for children as well as adults during the bleak years of The Depression. But the signs of it being produced at that time and for the niche children’s market are evident. Up until the Depression children’s wallpaper was usually of a lesser quality as it was meant to be replaced as the child grew and their interests changed. This paper contains a printed background as opposed to an applied ground color, which is a thicker base color applied on a separate machine that helps the paper age better. Also the excessive bleeding of the printed colors indicates the paper was run through the printing press quickly to maximize quantity and successive colors were not given adequate drying time. This is most noted in the red color which, when used as a blush, is not confined to the wearer’s cheek. However, these efforts to maximize quantity and minimize cost were probably greatly appreciated by those who could not otherwise afford to buy wallpaper for their children’s rooms. And the color bleed and slightly off-register print do not detract from the wonderful illustrations and delightful story of Alice as told by Tony Sarg.